Decimal Update, Hey Teach, and My Blog Featured! Tuesday evening after I got home from work, Decimal seemed pretty dry so I decided to try it on. It was still a little bit damp, but I figured I would at least get a good idea of the fit. I had been afraid that it might be too long after I saw how big it got after washing and after trying it on, those fears were realized. 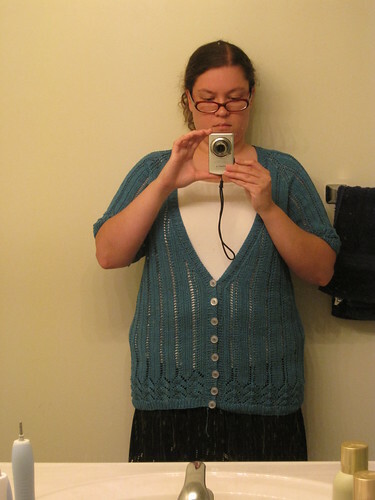 Please excuse the crappy bathroom mirror pictures, but I want to share what it looked like when I put it on. Now, I’m only 5 feet 4 inches tall and something this long really isn’t my style, nor do I think it looks very good on me (seems to just make me look even shorter then I am). I was pretty bummed after seeing this and decided to let it finish drying all the way before making a decision about what to do. I asked on Plurk and Twitter for opinions and most people said that since it is 100% cotton, a run through the dryer might shrink it up to a reasonable size lengthwise. Wednesday morning I checked it and it was completely dry, so I tried it on again. This time it wasn’t quite so long. It went almost to the top of my thighs, but not quite. Still not as short as I’d like. Today I’m going to put it through the washer and dryer to see if it shrinks up some. If it doesn’t or is still far too long, I think I’ll give it to my sister. She’s about the same size as me and I think she’d get some use out of it. Here’s hoping it works! After thinking about it, I realized where I went wrong and I’m going to share so that this doesn’t happen to you! Consider this a Public Service Announcement. For some reason I never looked at the schematic. (You can check it out here.) Normally I do, but I never checked it for this pattern. I wish I knew why I didn’t! That could have solved all of my issues right there. 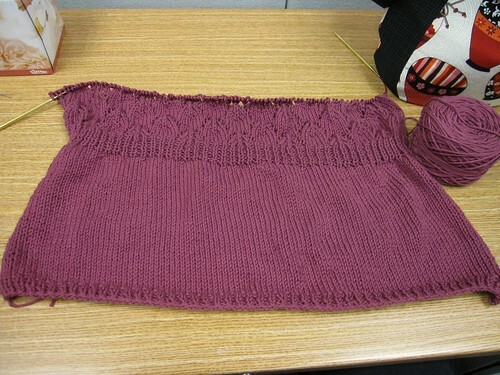 For the size I knit (49″), it says that the measurement from under the arm to the bottom of the sweater will be 16.5″. I don’t have the longest torso, so seeing this I would have realized that 14 or 15 inches would have been plenty and eliminated some rows while I was knitting the body. To add insult to injury, I also added an extra lace repeat on the bottom, which probably added another inch to the whole thing! Yikes! Obviously I didn’t take these things into consideration and just happily knit along thinking “Oh, it’ll be fine, it won’t be too long!” LISTEN TO THAT INNER VOICE! It’s usually right! Ah well… lesson learned, right? Hey Teach is working up really quick. I’m about to start the arm hole shaping on the back! At the rate I’m going this thing will be done in no time and I’ll be able to get a lot of wear out of it this summer. Today, Ida who blogs at Knit-A-While and runs Knitting Purls and Station KPFF, featured my blog in her post today! I think this is the first some anyone has wrote about my blog anywhere and it was really great to see. I don’t often get a whole lot of feedback about my blog or content, so it warmed my heart to hear that you (and I’m sure others) have been enjoying my blog! Thank you for such a great review of my blog, Ida. It’s been great getting to know you and so many others through Plurk, Twitter, Ravelry, and blogs. PLEASE let us know how it turns out! If it shrinks lengthwise, it might also shrink width-wise. you ok with that? I’d be okay with it shrinking width-wise a little. It has a bit of extra room there now, so that wouldn’t be too big of a deal. I’m going to measure it before and after washing and then make a post about how it turned out! Whatever you decide, the Decimal is gorgeous. And thank you for the reminder about checking the schematics! Your Hey Teach is going to be gorgeous. I can’t wait to see it finished. And I was very happy to give you a shoutout on Knit-a-While!